A quick click to the relevant character page should help you find the mark easily. The artists mark is either impressed or incised as per the marks on the image to the right (below on mobile site). You should note that some artists used more than one mark or monogram, especially when women married and their surnames changed. The impressed mark in this example being ‘d:’ for Olive Dale and the incised mark ‘RW’ for Rosetta S Woods. You can find both marks in the lists below. 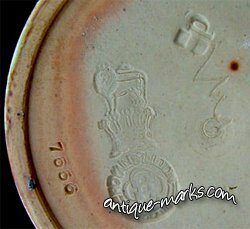 The Doulton lion and crown mark and the various pattern and date numbers are dealt with on our doulton marks page.